No tea party is complete without a boozy tea-infused cocktail! Join us on July 28 for Tea Talks and learn how to pull off your very own boozy tea party with panache. 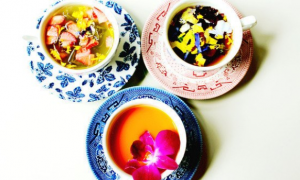 You’ll learn all about the quin-tea-ssential (we love our puns) tea bites firsthand from Chef Becky, Virgin Hotels Chicago’s pastry chef, drink and decor tips to throw the ultimate tea soiree of your own. You’ll be welcomed with champagne and go through a quick “Tea 101” lesson with Chef Becky, our pastry chef at Virgin Hotels Chicago. Followed by our Upside Down Tea Party regime that includes food (so much more than cucumber sandwiches), signature tea cocktails and hosting your very own tea party – with an emphasis on the PARTY. Let your tea cup do the talking so you can do the drinking! Space is limited and all guests will receive a special tea goodie bag, courtesy of Jenwey Tea, to take home.